This lovely message came to our Treestock Manager, Dawn Lewis, from Julia Genet at New Breeze Ltd.
"A very belated thank you for the large box of pine seedlings earlier this year. I have waited a while to thank you as I wanted to include a photo of our son Richard with the small trees. He has enjoyed the activities of digging holes and planting the trees and mowing in between them. 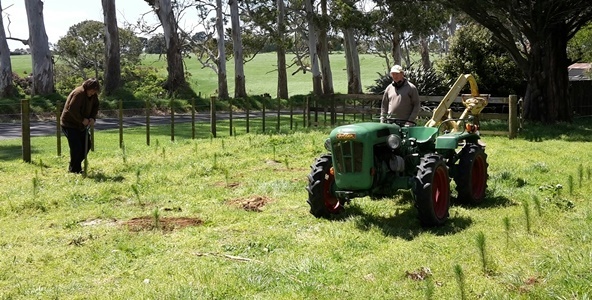 His passion is any activity that includes the use of his beloved tractor. Sadly this year we have had to buy a tree for Christmas so we are looking forward to these growing in a couple of years and being able to trim them and sell them to local people. We also give several trees to the Salvation Army to distribute to brighten other families' Christmas day. It is a great activity and often when Richard is out in this front paddock joggers and other people stop for a chat. So thank you very much from our family and Richard and his team of five support people. Wishing you all Seasons Greetings at PF Olsen’s."